I was quite looking forward to my day in Kidderminster. 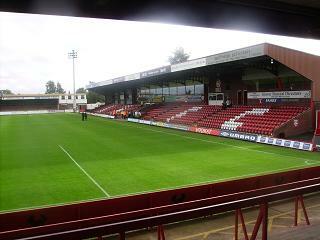 I had been to Kidderminster several times before and had always enjoyed friendly banter between the two sets of fans. Kidderminster fans are the friendliest I've met on my travels and are a far shout from those at Hull or Mansfield. 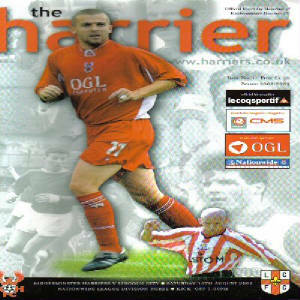 I had gone on the official coaches with the club and Kidderminster seemed an easy place to get in and is located in a reasonable position within Kidderminster. After getting off the coach, I headed straight towards the club shop and was greeted with smiles and very very polite people within the shop who were very helpful in helping me find a product. When you walk around a ground you expect to be given some trouble if wearing your colours from the local teenagers, however, I got quite a few "alright mates" which came as a pleasent suprise. As away fans usually are at Aggborough, we were given the choice of either standing in the terrace behind the goal or sitting in the stand at the side of the pitch and having experienced both in the previous two seasons, I chose the seating because the facilities and view were better than those in the terrace. The stand the awya fans in is shared with the home fans and is a really nice stand. 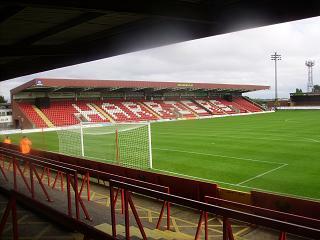 It is a medium sized League 2 seated area in similar sizes to stands at Chester or Cheltenham and the view of the action is excellent from anywhere in this stand. 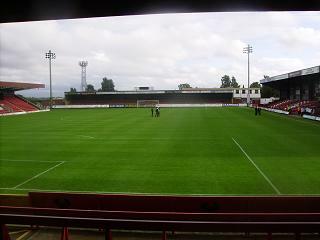 The one thing that I've always liked about Aggborough is that it is the correct size for Kidderminster. It's not like Darlington where you get a stadium they are never likely to fill, you have a quaint little ground that is fairly neat and pleasing to the eye. The other three stands obviously weren't as visually pleasing as the others. 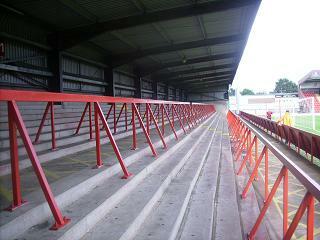 Both stands behind the goals were similar size terracing with the one holding away fans having a scoreboard about it. The stand opposite the one with away fans is another seated area although this is quite small and not particully eye-catching. Every bollard resulted in a square block of seats being removed, however, this puzzled me when I saw people walking behind the other seats and behind able to get between the seats and bollard with space to spare. 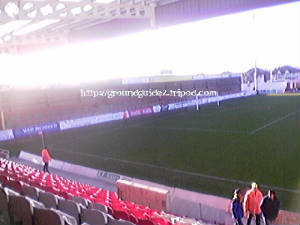 This stand also had the executive boxes around it. The game itself was a poor one from Lincoln's perspective and despite taking a 5th minute lead, City would lose 2-1 after a very poor performance. The atmosphere inside Aggborough was quite good despite of an inclusion in the pre-match songs of the "Witch Doctor" song by the Cartoons. Kidderminster fans sung quite loudly and for long periouds of time making the game quite enjoyable although the term "you only sing when your winning" does apply quite a bit to Aggborough. The stewards were very polite when informing everyone that the block nearest the Kidderminster fans was closed for City fans although you could see one or two of them just didn't want to be there. Overall, as usual, I enjoyed by day out at Aggborough despite of the result and the fact it was the first ever victory Kidderminster got over the Imps at Aggborough. I would seriously recommend this for a team travelling to see their team play or even just for someone who fancies going to a random game.